Crown Isle Resort and Golf Community in Courtenay is hosting an Open House on Saturday, July 23. Everyone is invited to join in on a fun family day at Crown Isle featuring prizes and giveaways, and the opportunity to learn more about the Crown Isle lifestyle. Vancouver Island's best known golf destination resort, Crown Isle Resort and Golf Community is a comprehensively planned 831-acre golf resort community has at its centre, an 18-hole, par 72 championship golf course, playable by golfers at all levels. The hub of the resort and community is the spectacular 48,000 sq. ft. Resort Centre. The Resort Centre houses dining and conference facilities, as well as a fitness centre, a golf shop and a teaching academy. Nearby, along the first fairway, 4.5 star vacation villas play host to families, couples, friends, and business travelers. The overall vision and theme of this master-planned residential community is carried out through Crown Isle's real estate development. The development offers residential lots, single family homes, semi-detached patio homes, quarter ownership villas and condominiums. A number of commercial and retail developments have also come to the area. The Vancouver Island Real Estate Board has released its 2010 Buyer Profile, tracking where people are coming from, what they’re buying and why. Statistics provided are for the overall VIREB area, and for each individual Zone (Duncan/Cowichan Valley, Nanaimo, Port Alberni/West Coast, Parksville/Qualicum, Comox Valley, Campbell River, North Island, and Islands areas). 6,272 letters were sent to residential buyers obtained from the MLS database for 2010. 1,582 responses were completed and entered into a database, from which the Buyer Profile was developed. Cameron Muir, Chief Economist with the British Columbia Real Estate Association, said the VIREB Buyer Profile reveals interesting demographic trends. Low mortgage rates and attractive pricing were key drivers again for 2010’s buyers. “Mortgage rates are not expected to increase much over the summer and when the increases begin, they are expected to be gradual,” Cameron added. 96% of sales transactions were homes purchased as a principal residence, with just 2% as investments or rentals, signaling little speculation in the market. The Buyer Profile also shows the popular home characteristics from the MLS database with the highest frequency. The most popular was a single-family detached unit (representing 60% of all sales,) with 3 bedrooms, 2 bathrooms, a double garage and a vinyl exterior, with ocean or mountain views. Welcome to Woodcote Mews, new duplex homes in Courtenay offering the perfect combination of convenience, quality and affordability. These Vancouver Island 1/2 duplexes feature 2 colour schemes to choose from, and come complete with a quality appliance package including a laundry pair, refrigerator, dishwasher and stove. The spacious new homes at Woodcote Mews are 1,320 square feet and feature main floor living with an open concept living room, dining room and kitchen. Upstairs has three nicely-sized bedrooms and a large 4-piece bathroom. Each home comes with its own private backyard. The development has attractive landscaping and a convenient location within the City of Courtenay just one block from Woodcote Park. Perfect for young families or as a vacation home, these new Comox Valley homes are priced at $211,900. The showhome at Trumpeter Pointe near Duncan on Vancouver Island is open Saturdays and Sundays from 1-3 p.m. The new lakefront residential development features serviced building lots for sale starting at $169,900. A select few new homes are ready for purchase, or the developers can guide residents through the process of building their new home. Set on the shores of Quamichan Lake, Trumpeter Pointe is setting new standards for lakefront homes on Vancouver Island. This quietly situated 24-acre residential subdivision with 49 view lots (about 50% sold) and 17 waterfront lots (12 are still available) features lake and mountain views, an abundance of green space, parkland, and walking trails. The planning, design, and new home construction all focus on ecosystem preservation and protection. The development is located minutes from Duncan and the Maple Bay Marina on Vancouver Island. For more information, visit the Trumpeter Pointe website. At The Gales in Ladysmith, on Vancouver Island, has seen a number of new updates this spring, including a new phase of patio homes - the new show home is ready and three more patio homes with stunning water view are now complete. The Vancouver Island real estate development has also created a new website. New patio homes at The Gales range in size from 1,550 – 2,780 sq ft and are built to take advantage of the spectacular unobstructed views of Ladysmith Harbour and Thetis Island. Featuring large windows to soak in the views and luxury fittings and finishings, the 42 patio homes and 26 condos at this Vancouver Island real estate development are designed and built in West Coast contemporary architectural style and floor plans are open, ideal for entertaining. New homes at The Gales range from $599,000- $650,000. Be blown away at The Gales. The new Oak Bay Beach Hotel in Victoria, Vancouver Island has now moved from the construction phase to the finishing phase, after celebrating its roof top party – marking the start of work on the hotel's roof. The stunning re-built Victoria waterfront hotel is selling vacation hotel suites, and luxury waterfront residences. About 50 per cent of the available units have already been sold, and the sales team is conducting regular site tours for those interested in owning their own Victoria vacation hotel suite or private waterfront residence. The Oak Bay Beach Hotel and Spa is also offering a travel package for buyers coming to Victoria form out of town. If you visit the sales centre, see the property in person and complete contracts with the Oak Bay Beach Hotel while in Victoria, the hotel will pay for your trip – including airfare and two nights hotel for two people. Contact the Oak Bay Beach Hotel Sales Team at 1-800-668-7758 to take advantage of this offer, now that summer has arrived in Victoria, Vancouver Island. 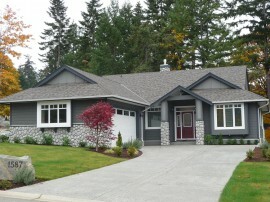 Nutmeg Homes has been building Insulated Concrete Forms homes in the Comox Valley, on Vancouver Island since 1999. “Our list of standard methods, materials and items generally grows and matures with every home we build,” says owner Paul Witt. “We strive for constant improvement in; our designs, energy efficiency, structural strength and long term sustainability. A home should be more than a major financial investment, it should also be comfortable, durable and efficient.” ICF houses use up to 40% less energy than the average new home in BC. Insulated Concrete Forms or ICFs are hollow foam blocks or panels, which are stacked to form the walls of the home. The forms are filled with steel-reinforced concrete to create a solid structure. The resulting walls offer solid construction that provides a draft-free, quiet, healthy and comfortable living environment. For more information on Nutmeg Homes and their ICF construction process visit their website. Luxury Vancouver Island oceanfront condominiums The Shores at King Coho in Comox, have only four remaining condos for sale. And prices on these stunning new Vancouver Island condos with ocean and mountain views have been reduced from their original asking price by as much as $70,000. The four available new waterfront homes now range from $549,900 – $658,000. Built by Muchalat Construction Ltd, who have numerous Vancouver Island real estate projects to their credit over 30 years in business, these waterfront homes feature 9-foot ceilings, fireplaces, granite counter tops, in-floor heating, custom showers with body massagers and soaker tubs. 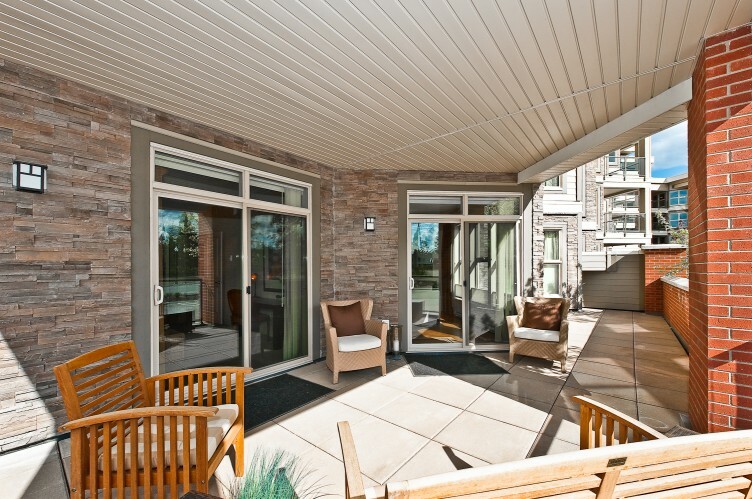 To enjoy the stunning views, each unit offers spacious patios and balconies overlooking the Comox Valley waterfront. For more information about The Shores at King Coho, visit their website. The Texada, Nanaimo's fastest selling oceanview luxury condominiums, is a contemporary West Coast designed, 89-suite development located in North Nanaimo. The modern condos for sale boast incredible Vancouver Island views of the Georgia Strait and Coastal Mountains. The design of the building was created to allow for maximum ocean and mountain views and each unit features oversized decks or terraces. The Texada is walking distance to local shops, entertainment, beaches and parks. 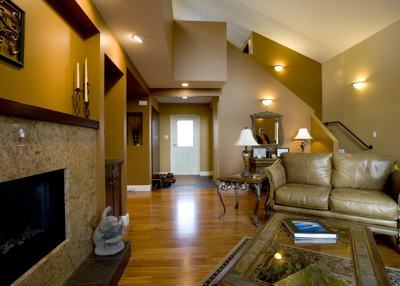 Three custom designed interiors allow new home owners the feeling of luxury at affordable prices. The Texada offers floor plans ranging from a one-bedroom plus den at 922 sq. ft. up to a two-bedroom plus den at 1467 sq. ft. The latest technology has been incorporated into the construction of the Texada including Rain Screen protection, plus No Burn retardant providing security and comfort for owners. For more information, stop by The Texada Sales Center, open dailly from 11-4 (except Fridays) at: 6310 McRobb Avenue, Nanaimo. 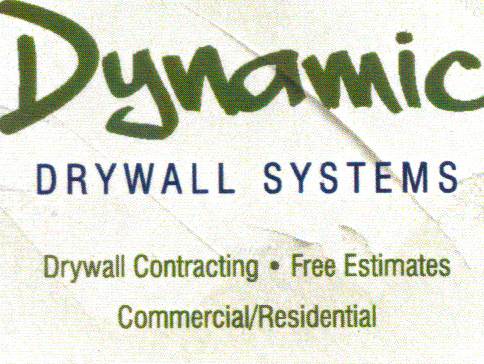 Dynamic Drywall brings a dynamic crew of experienced drywallers to the Comox Valley. Available for commercial and residential drywall projects from boarding to finishing, Dynamic Drywall offers professional and enthusiastic service. Quality work, clean job sites and work done on or ahead of schedule distinguishes Dynamic Drywall from the competition. With more than 10 years of experience serving Vancouver Island customers, Dynamic Drywall is now serving the Comox Valley including Courtenay, Cumberland, Comox and outlying areas. Contact them at 250.702.7722. The inventory of potential lots for sale in the Comox Valley is enormous. The inventory of residential lots in the supply pipeline may seem excessive, verging on oversupply, once they are all approved and brought onto the market. The number of lots for sale officially on the market with the Vancouver Island Real Estate Board’s MLS in Campbell River and the Comox Valley deserves some comparison. As of May 31 in Campbell River there had been 44 lot sales on MLS; 86% of them sold for less than $100,000. Five were between $100,000 and $150,000. The number of sales represented an increase of 19% over last year at an average price of $96,428. Meanwhile in the Comox Valley for the same period there had been 37 sales, three under $100,000, 15 between $100,000 and $150,000 and 13 between $150,000 and $200,000. The number of sales represents a decrease of 46% and an average price of $167,243. A commute of 30 minutes will buy a city lot for $70,000 less. And since lot prices are determined by the inventory of existing housing, it stands to reason average house prices are similarly less expensive. Average house prices in Campbell River are $60,000 less than in the Comox Valley. In the Comox Valley, only 27 lots are on MLS that are fully serviced and within municipal boundaries. In Campbell River there are 138. In this real estate environment of lower sales, builders are not rushing to claim lots, rather they are building on contract. Developers of land and of new lots are holding back waiting for more predictable demand. At this time, with the price discrepancy between the Campbell River and the Comox Valley, the Campbell River region offers value to buyers looking to purchase a piece of Vancouver Island real estate. WesternOne Rentals and Sales, a one-stop shop on Vancouver Island for equipment rentals and sales, is now also North Vancouver Island’s only authorized Polaris ATV and Ranger/RZR Utility Vehicles dealer, in the Comox Valley. Serving Courtenay, Campbell River, Port Alberni, North Vancouver Island and the Sunshine Coast. WesternOne is the only place on Vancouver Island to buy Canada’s number one selling ATV. They have Polaris factory-trained and certified technicians for any ATV parts and servicing needs. As Vancouver Island’s only Ranger/RZR dealer, WesternOne is committed to providing the same great customer service for their ATV sales and service as they do for their Comox Valley equipment rentals. WesternOne Rentals and Sales also rents, sells and services scissor lifts and aerial lifts; generators; air tools; concrete equipment; and forklifts on Vancouver Island. Contact them in Comox at 250.339.4518. Two exclusive new home developments in the Comox Valley, Vancouver Island, each have only one new residential lot left for sale. Gatehouse Place is a unique neighbourhood, with a rural setting, located in the heart of the City of Courtenay. 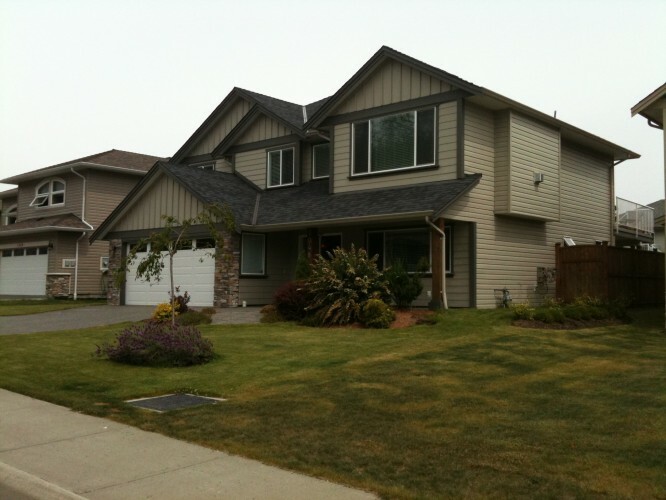 This 16 home subdivision features many new homes with views of the Comox Glacier. These large lots, averaging 1/3 of an acre, are located adjacent to three large fish bearing ponds with extensive aquatic plantings as well as a large natural park that has protected walkways and greenways. The final remaining lot is listed at $173,000. Trumpeter Crescent’s last remaining residential lot for sale is perched on top of some of the most scenic property in the Comox Valley. This area offers spectacular views of the Comox Glacier, the Beaufort Mountains and the Comox Valley. The last remaining home site is located within a well-established neighbourhood that contains both executive and west-coast style homes. The final lot on Trumpeter Crescent is listed at $357,500. For more information on both lots, visit realtor Phil Edgett’s website. Oak Bay Beach Hotel is now selling private luxury condominium residences and vacation hotel suites on the waterfront in Victoria, Vancouver Island, BC. The Oak Bay Beach Hotel is being redeveloped to become a world-class destination resort and spa with private residences. Located on the Victoria waterfront, this luxury hotel will showcase a seaside spa and hot mineral pools, the famed Snug Pub, a fine dining restaurant and live dinner theatre shows. The resort will be home for owners of the 20 luxury waterfront residential condominiums, and home-away-from-home for those with an ownership share in the vacation hotel suites. The refurbished hotel is scheduled to open March 2012 and the vacation suites and private residences are now approximately 50% sold. Vacation hotel suite pricing starts at $389,000. Private residences start at $1,000,000. For more information, visit the Oak Bay Beach Hotel website. 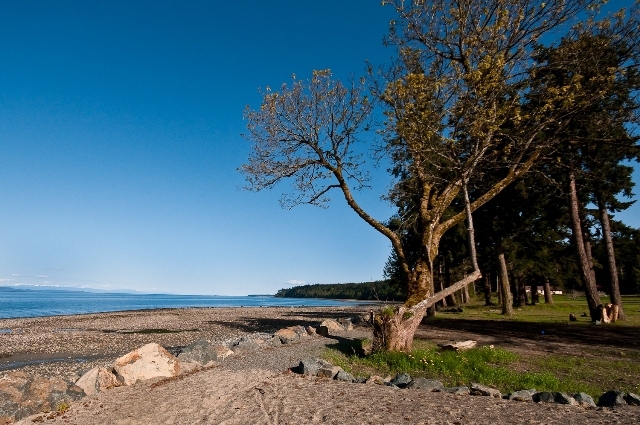 The final Selection Day at the Vancouver Island beachfront development Qualicum Landing is Saturday, June 25, 2011. Qualicum Landing near the town of Qualicum Beach is the fastest selling waterfront community on Vancouver Island, with more than 70% of these new beachfront homes selling in less than two years. Two Capilano floor plans remain in Qualicum Landing’s Poolside phases. The Selection Day incentive on lot # 47 is a savings of $78,000. Only Five Lots left in the Oceanside phases: on Selection Day save $100,000 on lot # 38 with a Hollyburn floor plan. And only one home is remaining in phase 17, now priced from $399,000. To participate in selection day, visit the Qualicum Landing website to sign up. Registration holds no obligation to purchase. A good selection of rural estate home lots is still available at Trent River Estates in Royston, just south of Courtenay in the Comox Valley. Build your custom dream home on property backing onto the Trent River, or admire the sweeping mountain views from your 1.3-2.7 acre property. The development features underground hydro, telephone, utility services, and each residential lot has an approved septic area. There is a building scheme in place and the zoning on these Vancouver Island building lots allow for a Carriage House. 7 of these stunning Vancouver Island estate lots are still available. For information about other residential lots for sale in the Comox Valley, see our real current real estate projects. Chemainus Garden Holiday Resort features beautiful cottage-like park model RVs for seasonal or year-round living, starting at only $79,900. These Vancouver Island cottages for vacation or permanent living are an affordable retirement option. Chemainus Garden Holiday Resort offers a carefree lifestyle of freedom and fun, in a quality home in a park-like setting on southern Vancouver Island. Live and play in Chemainus Garden’s 36-acre resort, surrounded by duck ponds and beautiful gardens with plenty of private walking trails for people and pets. Minutes to the world famous “Little Town That Did” - Chemainus - where home owners and guests alike enjoy quaint local shops, one of the finest theatres on Vancouver Island and a friendly atmosphere only found in small towns. Construction Pete White – Kinetic Construction Roger Yager, Knappett Projects Inc.
For more information, call 250-388-6471 or email manager@vicabc.ca. The Schooner Cove and Lakes District Neighbourhood Plans for the Fairwinds Community at Nanoose Bay have passed a major milestone on their way to becoming a reality after the Regional District of Nanaimo board gave third reading to bylaws incorporating both Schooner Cove and the Lakes District plans into the Nanoose Bay Official Community Plan. Highlights of the two plans include the revitalization of Schooner Cove as an oceanside marina-oriented residential village, with the addition of a public waterfront boardwalk, shops, cafés, neighborhood services, parks and walkways. The plan for the Lakes District calls for a 300-acre public park, as well as a mixed array of single and multi-family homes, all connected by hiking trails and pathways. Fairwinds is a well established residential community with several current real estate projects on the market. Ocean and golf course view lots set on a quiet cul-de-sac at Bonnington Ridge in Fairwinds are now selling, with only four lots remining. 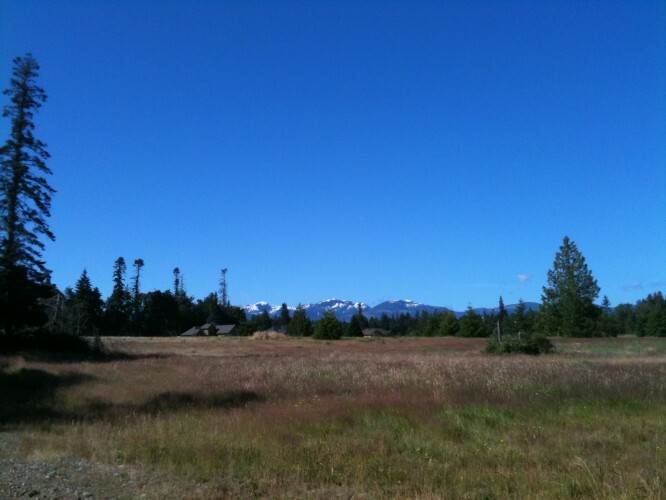 These Vancouver Island view lots range in size from 1/3 to over 1/2 acre. Pattie's Portable Potties is a Comox Valley-based business which supplies and services portable outhouses (porta potties) and pump out services for central and north Vancouver Island, covering Parksville, Courtenay, Comox, Cumberland, Campbell River and the North Island. 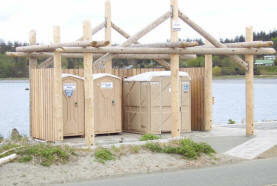 Patties Portable Potties provides: portable washroom rentals for construction trade and special events on Vancouver Island; pump out services for Vancouver Island homes and RVs; executive and handicapped units for short or long-term use. For more information visit the Pattie's Portable Potties' website. Nutmeg Homes uses Insulated Concrete Forms to build energy-efficient green homes in the Comox Valley on Vancouver Island. Focussing on high-end, quality construction and green building, Nutmeg Homes builds new custom homes with irresistible radiant-heated floors, draft-free walls, large windows and wide-open spaces. Insulated Concrete Form Construction is a system that uses hollow insulating expanded polystyrene blocks that hold steel rebar and click together. The forms are then filled with concrete, which is then ready for siding and dry wall. ICF homes feature benefits including: healthy, quiet homes with modern air filtration and fresh air exchange systems making them virtually dust and pollen free. In addition, Nutmeg Homes has voluntarily started to rate their homes with the Energuide rating system, and are exploring the LEED rating system. For more information, visit the Nutmeg Homes website. Only 4 residential lots remain for sale in Phase I on The Slopes of the Lake at Lake Cowichan on Vancouver Island. Phase II has also seen a number of sales, where only 16 lots are still for sale, awaiting new custom homes. The Vancouver Island residential lots for sale at the Slopes at the Lake are large and sunny and located in a family-friendly residential neighbourhood. 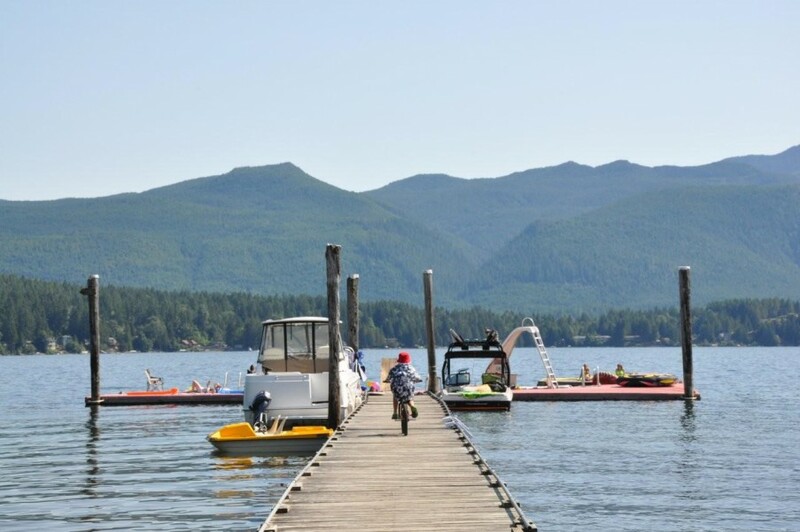 Only minutes from the lake and surrounded by this Vancouver Island region’s many recreational opportunities, The Slopes at the Lake is located in the Town of Lake Cowichan and is only minutes form the amenities of the larger community of Duncan. Lots at this development start at only $94,500. Visit the Slopes at the Lake website for more information. Valley Carpet One Floor & Home has built their Duncan floor covering business by providing positive experiences for their customers. Valley Carpet One has been operating in the Cowichan Valley on Vancouver Island since 1977. In 1994, the store joined Carpet One, a retail flooring co-op with the buying power of 1,500 stores. As part of a worldwide co-op, Valley Carpet One not only has enormous buying power, but they have partners in all of the major brands, mills, and manufacturers. 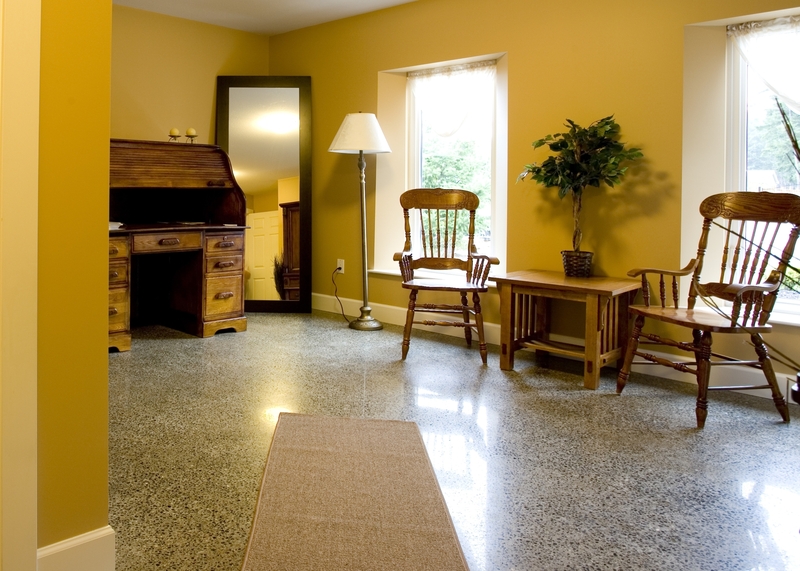 Valley Carpet One offers the largest selection of carpet, hardwood, laminate, ceramic tile, vinyl, area rugs and more - and you'll always find the best products and great savings, everyday. The Courtenay hotel Holiday Inn Express & Suites Comox Valley was recently honoured with the 2010/2011 OSAT Award from the Intercontinental Hotel Group. This award represents Overall Guest Satisfaction and is voted on by guests of the Comox Valley hotel who have stayed at this new Holiday Inn Express and Suites. After their stay, all IHG hotel guests are emailed a survey that asks them to rate their overall experience. As a result, the Comox Valley Holiday Inn Express took 1st place by maintaining an average score of 94.81% for the previous 12 months - the highest score of any of the 21 other IHG properties in British Columbia and 2nd place of 36 hotels in Western Canada. After opening its doors in March 2009, this Courtenay hotel has become a favourite with business travellers and families looking for accommodations in the Comox Valley. The Vancouver Island hotel features luxurious guest rooms including Family Suites, Jacuzzi Suites, Accessible Rooms and Pet Friendly Rooms. All guests are provided on a complimentary hot breakfast and can enjoy amenities such as a 24 hour Business Centre, 24 hour Fitness Centre, 24 hour Guest Laundry, free Wi-Fi and free parking. For more information or to make a reservation, visit their website. Twenty-one new homes on Centennial Drive in Courtenay, Comox Valley, are now complete and ready for families to move in. All of these new town homes in Courtenay are 1,050 square feet in size, with three bedrooms and two bathrooms. Features of the Diamond Park town homes include hardwood floors, custom cabinetry, upgraded lighting and contemporary interior finishing. Each new home comes complete with stainless steel kitchen appliances and a washer and dryer. The project also includes sprinkler systems, backyard patios and fenced yards for each unit. A children's playground is also on the property. This new Vancouver Island real estate development offer excellent value, with new homes starting at $195,900. The Vancouver Island oceanfront real estate development Claddagh Estates, is designed to take full advantage of the property’s stunning ocean and mountain views. Part of the town of Comox, near Courtenay on Vancouver Island, Claddagh Estates features fully serviced lots that include municipal water, sewer and underground services. Building guidelines are provided to protect each owner's investment by ensuring quality home construction. Homes will be restricted to the height of two stories, located so views from the other properties are not blocked. Environmental consultants were retained to plan and protect the riparian areas where a number of bird species - including the bald eagles – are found. The owners have enhanced the wildlife corridors beyond existing requirements to maintain the traditional migration paths of the deer and other wildlife found in the area. Claddagh Estates has reduced prices on remaining lots and now offers waterfront and view properties range from $225,000-$495,000. Construction is well underway on the second phase of Vancouver Island vacation homes The Maples at Sproat Lake. The new real estate development is located west of Port Alberni on Sproat Lake. The Maples vacation homes will eventually be a Vancouver Island waterfront community comprised of 24 new strata homes on five lakefront acres. Featuring a large sandy beach and a 2,100 square foot dock, the development is ideal for families. Each unit will be designed to take advantage of the views and the forested surroundings, and will feature West Coast contemporary style architecture. For more information about the project visit their website. 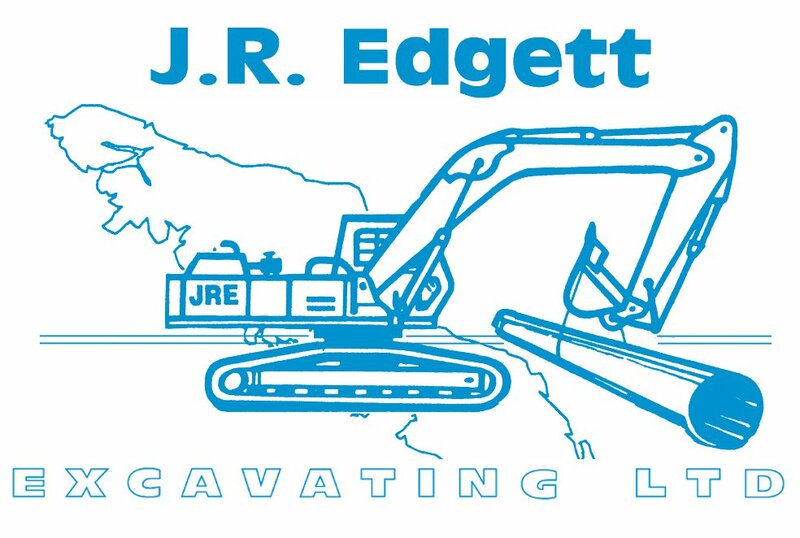 With a crew of 30 employees working in and around the Comox Valley on Vancouver Island, J.R. Edgett Excavating has the equipment and ability to plan and complete projects to their client’s utmost satisfaction. Call them today at 250.339.6100.